For the past few months, I’ve been walking you through my pre-writing process for tackling the writing of any new nonfiction book, including everything from getting uber-clear on what the finished book will be, becoming familiar with competitive titles, figuring out when and where to write, and setting up a plan and system for accountability. Now, not everyone writes with an outline. And to be honest, when I first started writing my current work-in-progress, I opted to go outline-free for a while to see what direction the writing took me. But in general, and especially when I’m writing prescriptive nonfiction, I always begin with an outline for the entire book. The more detailed, the better. So, first, to define what I mean by an outline. Book outlines are like blueprints for the proposed book. They include a chapter-by-chapter breakdown of the overall structure and, as much as possible, feature detailed lists of all the key themes, topics, and pieces of information that will be included in each chapter. For me, writing a book outline is where the real work happens. Because figuring out how to organize a flurry of ideas centered around a core concept in a way that the reader will be able to easily digest and assimilate into their own world is no easy feat. Writing a draft from a well-written outline is like embarking on a scavenger hunt with an map of where everything can be found. Creating a good outline takes time, patience, and a willingness to stay with it no matter how difficult (or hopeless) it seems. But it always pays off. 1. 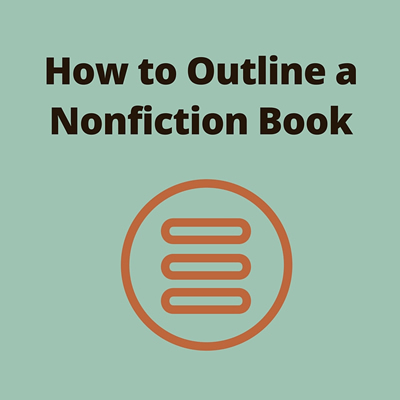 GET INSPIRATION FROM OTHER BOOKS: Notice how other nonfiction books are organized, especially those that are presenting their ideas in a way you think could work for your subject matter. When I was writing my last book Doable, I was influenced by Chip and Dan Heath’s fantastic book Switch: How to Change Things When Change is Hard. I appreciated the way the Heath brothers walked the reader through their process, incorporated case studies and anecdotes, and recapped the learning at the end of each chapter. Read and flip through as many books as you can for ideas on how you can best present your ideas. 2. BREAK OUT THE INDEX CARDS: When I’m ready to start writing down ideas, I start with index cards (Post-Its can work just as well, or even plain pieces of paper). I write down one main idea on the front of each index card, sticking with the main themes that I imagine will eventually become the chapters of the book. 3. BRAINSTORM CONTENT FOR EACH THEME: Once I have all my BIG themes written on the front of individual index cards, I flip the cards over and brainstorm a list of every concept, subject, and reference that I want to be sure to include as part of that theme. To ensure I don’t miss anything here, I refer back to my idea notebook and articles I’ve researched, with an aim of finishing this step with all of the main content of my future book scribed on these cards. 4. TRANSFER CARDS TO THE COMPUTER: Next, I type up my cards into one long Word document in outline form. So each BIG idea is written in all caps and bold, and then each small idea / theme / concept is included below in one long bullet-pointed list. 5. PRINT IT OUT AND REVISE: Once I’ve finished keying in all my written material, I’ll print out the document, double-spaced, let it sit for a few days, and then go back and do one more paper revision of the document, putting in additional information I want to include in each chapter (quotes from other sources, references to research, ideas for diagrams, anecdotes, images, etc.). I’ll also rearrange the “chapters” so the book is in a logical order. By the time I’ve completed these five steps, I’ve got a working draft of an outline that is in good enough shape that I feel ready to begin the actually writing of the book (yahoo!). In my next post, I’ll share my best practices for setting yourself up for success for embarking on the writing of your book.